To hell with the Prius, I want this!! 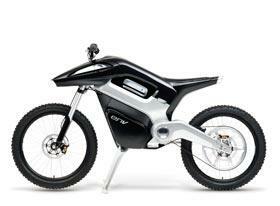 The ENV (pronounced "envy") is a fuell cell motorcycle that runs silent, at a top speed of 50 mph. The only exhaust is heat and water. The article says, "Users have compared riding the nearly silent motorbike to skiing, sailing, surfing, and glider flying. 'If you go for a ride in the countryside, as you ride through it, you can smell the countryside, hear the birds singing, and you are not disturbing nature," Eggleston said. "Birds will not fly out of the way because they are terrified of the noise.' "
I do have two questions: 1) If fuel cell vehicles produce heat, does that affect global warming? And, 2) Where can I get compressed hydrogen for fuel? The bikes are expected to be on the market at the end of 2006, and will cost between $6000 and $8000. Until next year, I'll be practicing: arms outstretched in front of me, one hand twisting the accelerator, and I'll be trying to stop myself from saying "ring-ding-ding-ding-ding-ding-ding." The Patriot Act in Action! If you want proof that the Patriot Act isn't about terrorism, but about broader police powers, read this article. Police, using the Patriot Act, you know, the one that is supposed to protect us from terrorists, have arrested drug smugglers in Washington state. They used a "sneak and peak" warrant to gather evidence. Under a sneak-and-peek warrant, also known as a delayed-notice search warrant, a judge authorizes police to search a suspect's property without leaving any trace they were there. Whalley said investigators arrange the timeline of the delay with a judge and most often notify suspects within 30 days. Doug Whalley, an assistant U.S. attorney in Seattle, said the Patriot Act codified already-existing law, making it difficult to challenge the use of sneak-and-peek warrants in court. Rulings before the act were made on a case-by-case basis, Whalley said, and appeals courts could have ruled the warrants were improperly issued. But Lisa Graves, senior counsel for legislative strategy for the American Civil Liberties Union, said that under these warrants, police routinely don't tell suspects they have searched their homes until months later. Graves also said the new Patriot Act provisions have been an attempt to give law enforcement a blanket ability to conduct secret searches without being held accountable. "The Justice Department decided to create a statutory right across the board," Graves said, "to try and create a national right of law enforcement to create secret searches of businesses and homes, secret seizures of evidence." One critic complained that the poice used the Patriot Act because it was easier than following standard procedure. "Your papers. Vhere are your papers!?" Guess we better get used to hearing that. So, the Biblical end times occurred almost 2000 years ago! Now, they're going to have to rewrite all those "Left Behind" books. Aloha, ya'll. I'm not just some haole, you know. All the nani wahinis know I'm cool. Good thing they didn't ask any questions about talking to myself. Here's a pretty picture to look at. I drew it a few years ago. 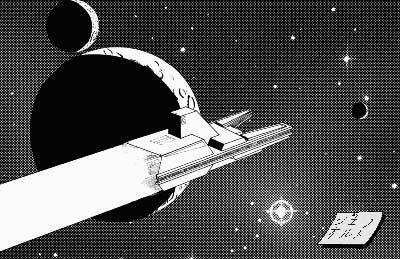 The design of the ship is based on a pre-production sketch for the "Buck Rogers" tv series from the 80s. Starlog did a spread on the run-up to the series, and I liked the design. I wish I could remember who designed it, so I could give them some credit. We have had a storage unit for about 10 years. It's been filled with old furniture, books we can't bear to part with, my comics, my nephew's toys. A few years ago, I was looking for something, and I took my Gargoyles off and started digging. When I went to leave, I couldn't find the sunglasses! I spent another hour looking for them and came up empty. I had to go online and buy another pair. On Tuesday, my now-grown nephew and I were looking through some of his toys, when I spotted the glasses. The box of toys was literally the last box in the storage unit! We have been unloading the unit for a month, and I kept telling anyone who was with me, "If you find a pair of Gargoyles, they're mine." This is one of the few times I have found something, not only in the last place I looked, but in the last place they could have been.